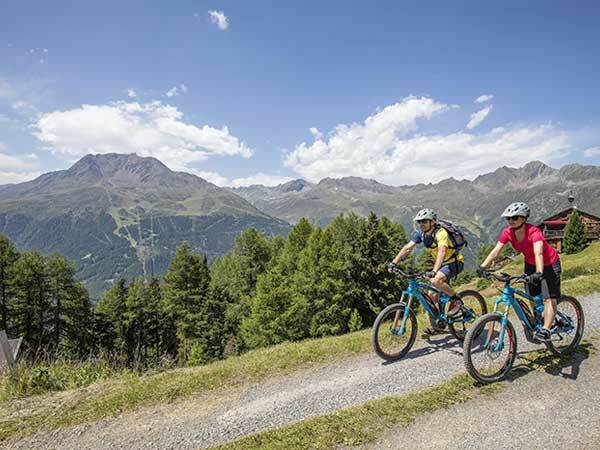 We rent our E-bikes at one of the sport shops in Sölden. 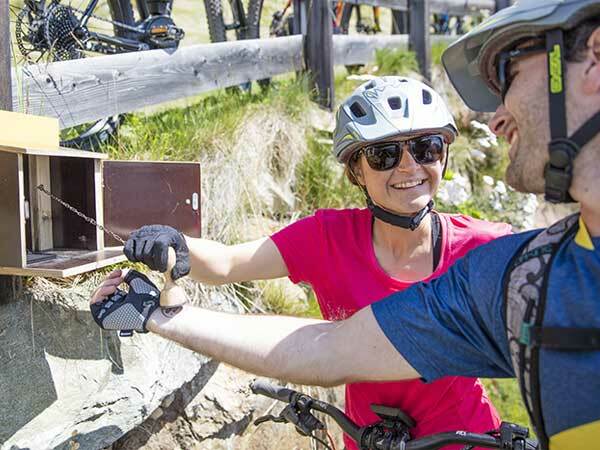 My workmate Manuela joins us, she is a passionate downhill biker and knows the Bike Republic Sölden like the back of her hands. Plus a photographer! 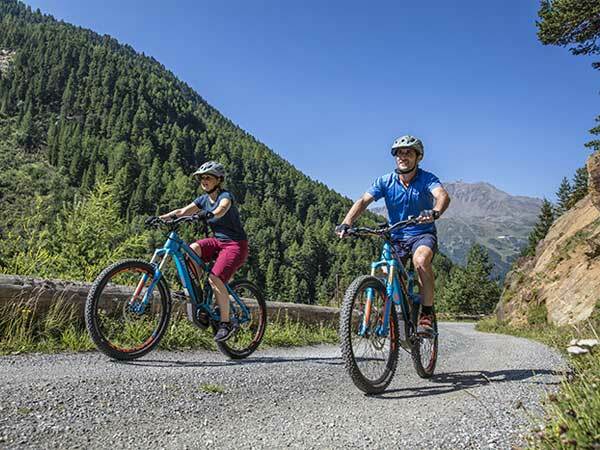 We want to make the most of this beautiful sunny day and take some fabulous pictures of our E-bike tour. 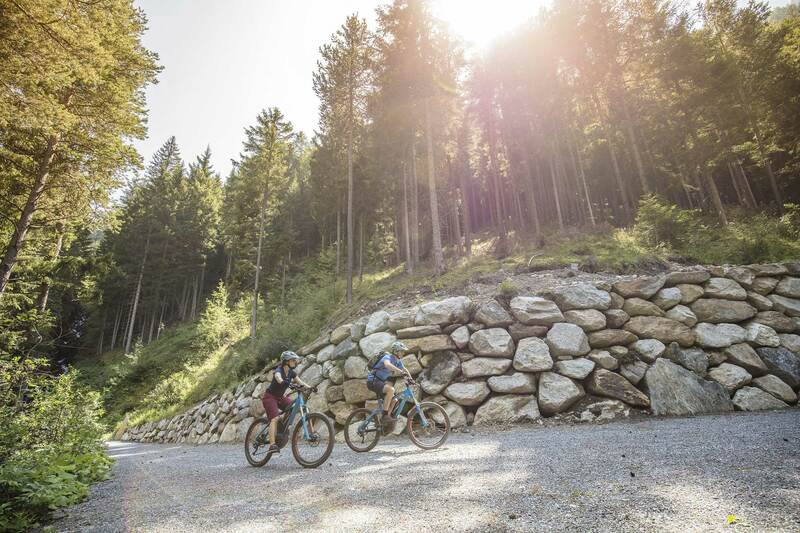 We get three full suspension mountain bikes – rather bulky and sturdy vehicles, perfectly suitable also for Sölden’s Single Trails thanks to their huge spring deflection. The bikes weigh more or less 20 kilogram each. After a quick introduction by a shop assistant we know everything about the most important functions. There are only 3 buttons to adjust the electric engine: on/off button, one button to increase engine power and one button to decrease it. We check the battery (fully charged! ), then the right position of the saddle (done! ), we rent a bicycle helmet (it fits!) and off we go. While we try to push our E-bikes outside, the shop assistant shows us another button on the handlebar: we press the button and the E-bike almost “walks” alone – what a luxury device! Finally we start the tour. I am very excited on my first E-bike meters. Fortunately we bike along the level asphalt road for a couple of hundred meters. So we become accustomed to our E-bikes step by step. 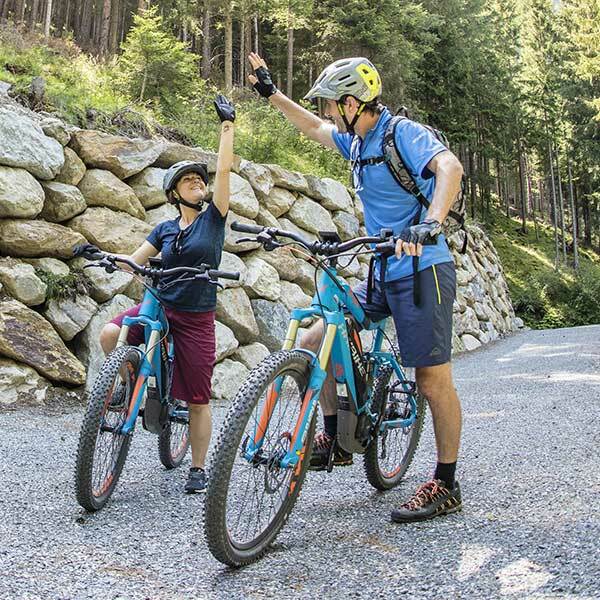 But one thing is for sure: there is no need to worry – the electric power provided by the engine makes a great pedaling support as soon as you move. 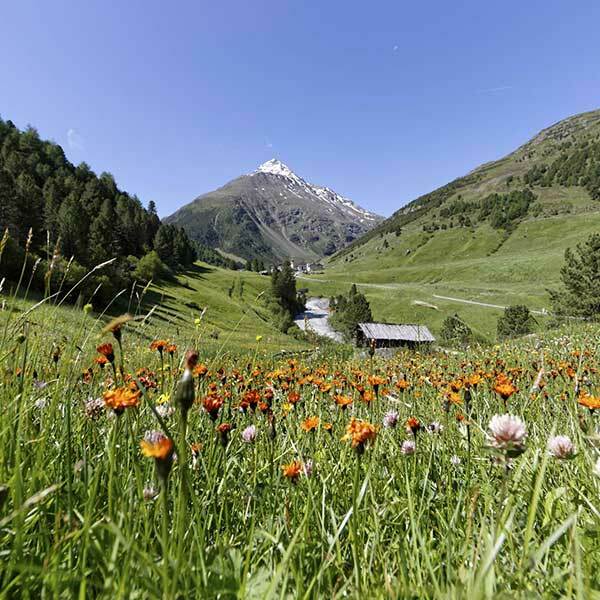 We decide to explore scenic Windachtal – a secluded side valley also known as Sölden’s Silent Part, followed by a visit to Kleble Alm. 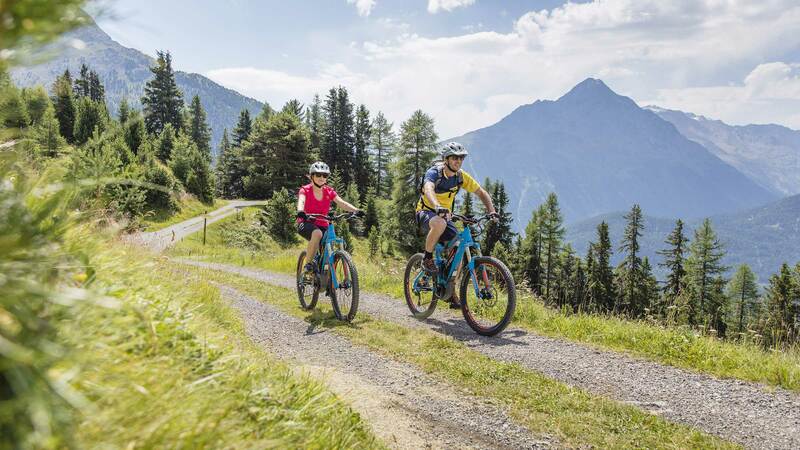 On the steep forest trail towards Windachtal the E-bike can show all its power. We increase the electric support, ranging from “Standard” and “Economy” to the highest level. Biking uphill seems very easy, you don’t even notice the heavy weight of the E-bike. After a few minutes we have already conquered the first hundred altitude meters. Beads of sweat included. As the ascent seems quite easy to me I am pedaling at a much higher speed. I remember the vicious circle – in the positive sense. On the way up to Windachtal, towards Fiegl’s Hütte, we have already taken a couple of magnificent pictures before we reach the cozy mountain hut of Kleble Alm at 2015 meters above sea level. 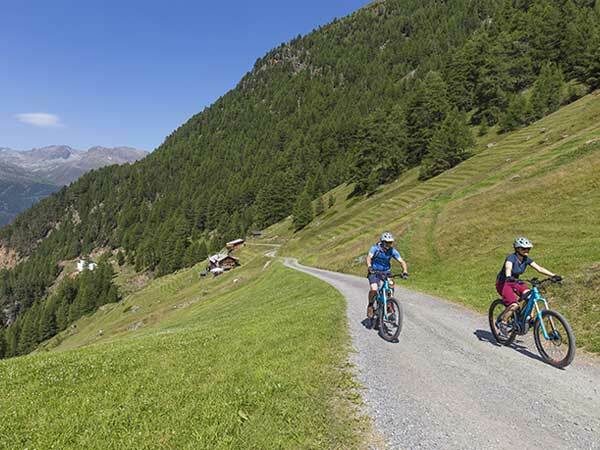 The high Alpine plateau surrounding Kleble Alm offers picture-book views of Sölden and the huge ski area located opposite – as well as of the new “Harbe Line” flow trail close to Hochsölden. 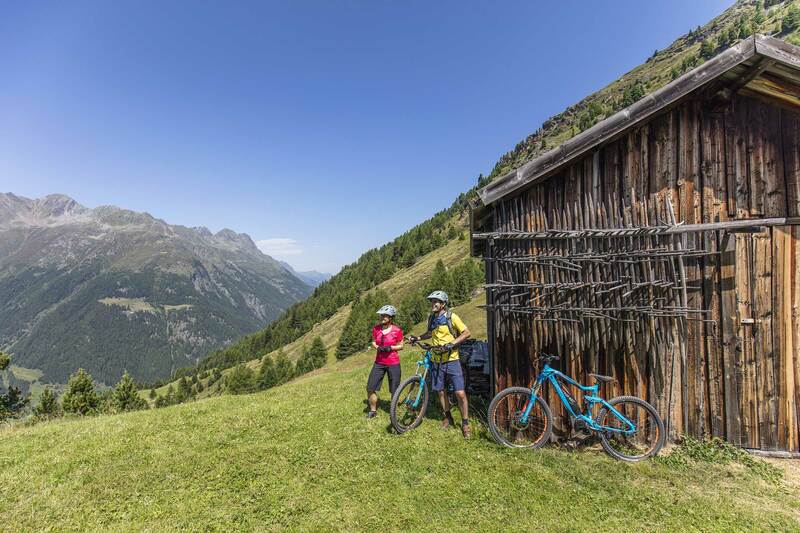 At Kleble Alm you also find a stamp site of the Bike Republic Sölden. 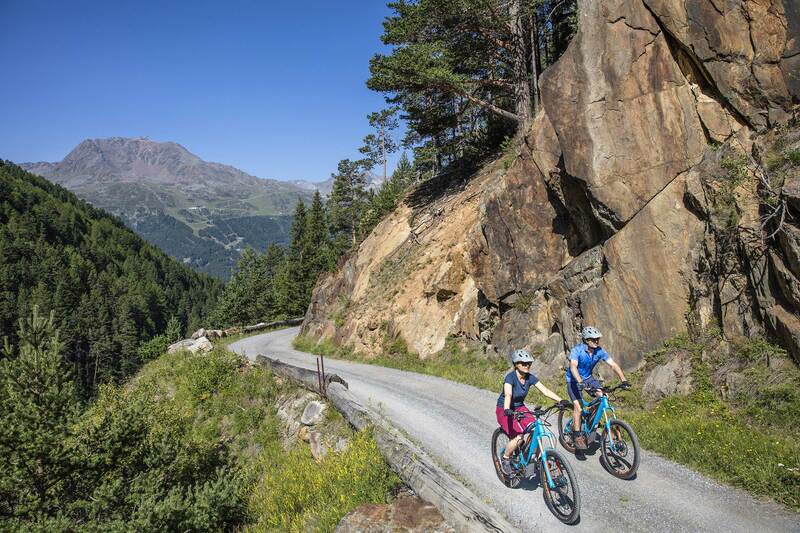 This is also the start of challenging “Kleble Alm Trail” down to Sölden, a demanding 2.2 km long track of intermediate difficulty, ideal for full suspension E-bikes. 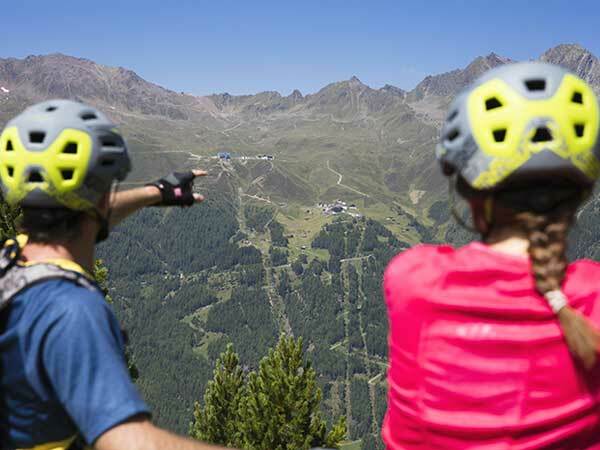 What’s more, in Sölden’s Silent Part there are no mountain lifts. On our first day we bypass this challenging section by rolling down the gravel path. Great fun especially on E-bike fullies with wide wheels! Once arrived in Sölden, we urgently need a pizza before we head for the 1st section of the Ötztal Cycle Trail in the afternoon. Although the pizza sits heavily on my stomach I enjoy pedaling with electric support. 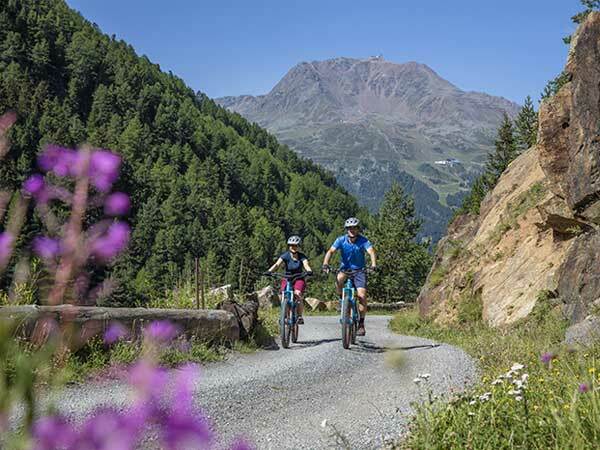 The first section of the magnificent cycle path travels from Sölden to Aschbach, there is almost no change in elevation except some really short ascents. 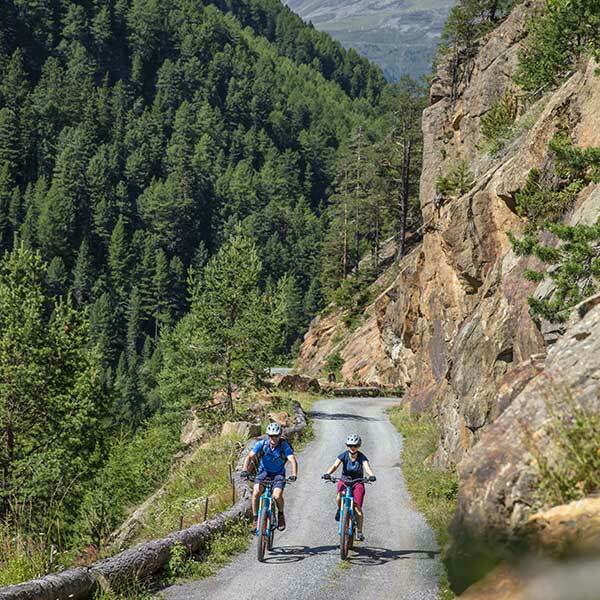 A pleasant bike tour along the shores of Ötztaler Ache river, accompanied by a cool breeze. Two kayakers try their luck on the rushing mountain brook – a truly spectacular photo spot! A couple of breathtaking pictures later we return to Sölden happily. A short check of our batteries: there is enough power left! So I give everything I can, and my E-bike does just the same. I try the highest power level, reaching Sölden at high speed but still in a relaxed position. E-biking is fun as hell! Incredible what we did in a single day. Despite of my electric support I must admit that I feel fairly exhausted and tired out at the end of the day.